I just wanted to make sure that people knew that 5 Reasons Stoicism Is Better Than Everything is on Audible, ACX, and iTunes. I think hearing my book read by Carrie Burgess sounds much better than when I sub-vocalize it in book form. It’s a little more than an hour audio. 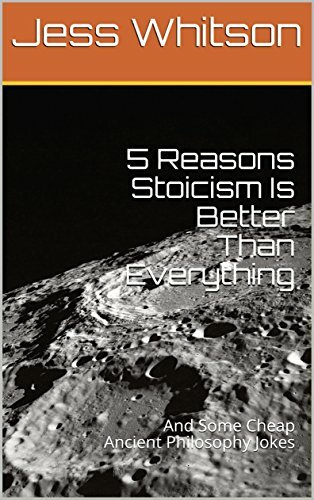 You can also get 5 Reasons Stoicism Is Better Than Everything in Kindle or paperback. Why was the cooking competition so terrible to watch between a Platonist, a Stoic, and an Epicurean? The Epicurean made a really good chicken Marsala but she started dividing it up into its constituent atoms since she reasoned that everything really was atoms and the void. She spent the rest of the competition just slicing and dicing, trying to get to the indivisible atoms. The Stoic had the job of making BBQ chicken wings. This seemed manageable at first but the Stoic couldn‘t do it because it wasn’t in his power. He judged the bbq chicken wings as a preferred indifferent. But since it wasn’t in his power, he couldn’t make it. But he was very virtuous though. The Platonist was making crab salad but every time she was done making it, she’d take it back to her table and try to perfect it until it was the Form of crab salad. Eventually she just threw it away and served the judges her recipe, which she said represented the true form of crab salad not a cheap imitation. Plato: Properties like white and red are universals that exist beyond material objects but they do participate in them. Aristotle: Properties like white and red are universals that exist only in material objects. Stoics: Properties like white and red are just words we give a collection of white and red objects. At best they exist in the mind. Diogenes: I pissed off Plato the other day. I plucked a chicken and took it to the Academy and said, “this is your featherless biped.” His face went from white to red.